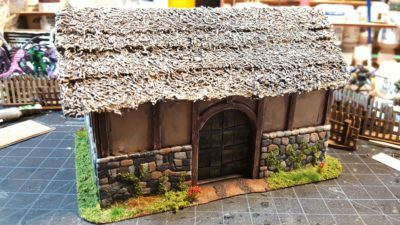 Way back in June of 2011, I started a fairly small half-timber barn for 28mm, for either my ECW/TYW stuff or early 20th C pulp gaming. 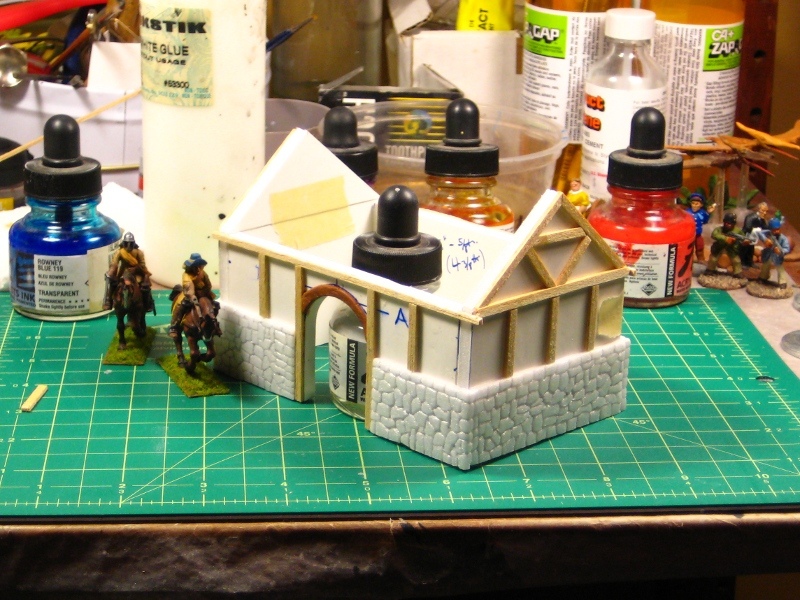 I’d gotten most of the painting done on the building six years ago, then moved on to other projects as the 16th C ECW/TYW gaming failed to grab my attention. The barn has floated around the edges of my painting bench, almost but not quite finished, ever since. 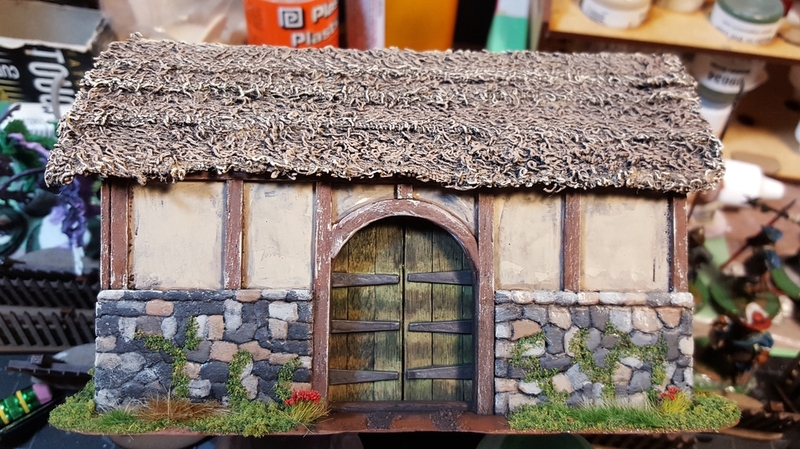 Earlier this week I was off sick and needed something sedentary and easy to do, so I pulled the barn out and started adding doors, some final paint touchups, and flocking and terrain around the outside of the walls. 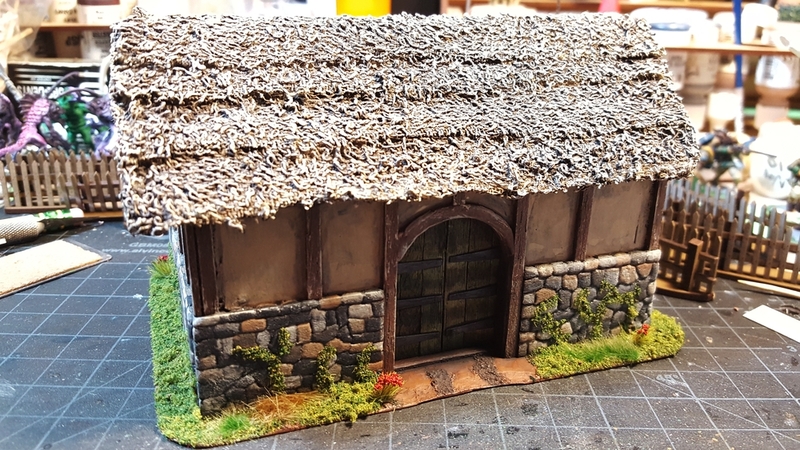 I’d originally planned, long ago, to do hinged arched doors on the big front doorway of the barn, but decided that six years of not figuring out how to do that in a wargamer-proof way was long enough and have gone with simple closed doors across the back of the arch! A stone-and-halftimber barn, work in progress. Click, as usual, for larger. Here, all finished and detailed, is the barn in April 2017! Barn, front view. Click for larger. Barn, back wall. Click for larger. Barn from the front left corner. Click for larger. The big front door is wooden coffee stir stick planks over an offcut of picture framing card (matt board), cut to size, and then roughed up with sandpaper, an Xacto knife, and a razor saw. The back door is just card, with planks scored into it with the back of an Xacto knife. The hinges on both are scraps of light card painted with Tarnished Steel. Both doors got all-over washes with several different colours of wash, including green on the front door to stain the wood. The roof is towel thatch (this was the first thatch building I’d ever done!) with thin foam for the stonework on the bottom half of the walls. The greenery is a mix from all over, including the nice red flowers from Rain City Hobbies over in Vancouver. For more details on building the barn, check the two 2011 articles I linked to right up in the first paragraph of this post, there’s lots of detail there. Nice to finally get this building done and dusted after nearly six years of three-quarters finished limbo! 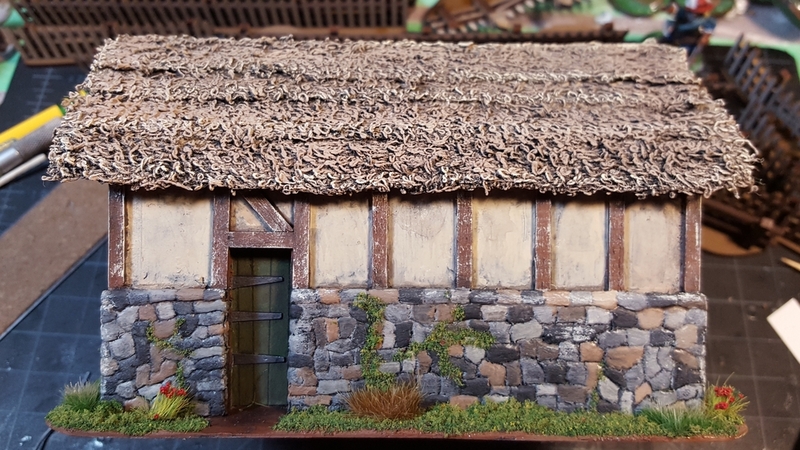 Now I need to consider other buildings for an English Civil War or Thirty Years War hamlet… some cottages, maybe a version of the interesting dove cote seen in the ECW edition of WS&S I picked up at Trumpeter Salute. We shall see!